Bicycle decks have long been a mainstay for magicians and card enthusiasts alike. Now you can pick up decks cheaper with Bicycle 808 Seconds. They have the same quality and reliability you expect from a Bicycle deck, but with slight color distortions compared to regular decks of 808 cards. Choose the name you trust and pick up your decks today! Maybe I just got `lucky', but I'm really not seeing much wrong with the cards in the cards I received. It's basically a deck of standard Bicycle riderbacks, but where it didn't meet quality control and is sub-standard in some way (which I couldn't even really notice!) For the price, it's great value, hence five stars from me. I bought these to use as duplicate cards for decks that were missing a card or for magic effects. Supposedly these cards are seconds, and apparently you can expect color distortions or cards to be printed off center. The colours all looked pretty normal on the deck I received, and all that I could notice was the printing of the faces was very slightly off center. 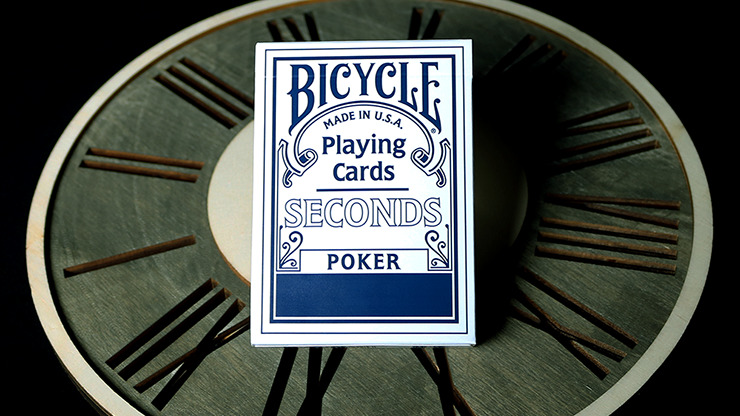 I have heard reports of people getting `Bicycle Seconds' decks where the colours were quite off, e.g. yellowed backs on some cards, but mine were pretty much perfect. So no complaints at all from me, the slightly off center is hardly even noticeable, and for the price, it's excellent value. Perfect as a practice deck for cardistry, back-up deck for magic, or source for extra cards.